Sondra Ray - Rebirthing And Physical Immortality | Let's Live Forever! Below is a video of Sondra being interviewed in July 2007, in a Virtual Light broadcast. It’s 25 minutes long, and is mainly about rebirthing and birth trauma—she starts talking about physical immortality at about the 16 minute mark. Sondra started out in nursing. She obtained a B.S. degree in Nursing from the University of Florida College of Nursing and a Masters Degree in Public Health and Family Sociology from the University of Arizona. She was trained as a Nurse Practitioner in Obstetrics and Gynecology, and as a young woman worked in the Peace Corps, stationed in Peru. By 1974 she found herself with her hair falling out and with various other issues, and she tried rebirthing, with the “founder of rebirthing”, Leonard Orr. 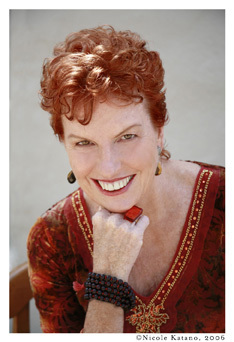 Together with Leonard and others, she became a pioneer of the rebirthing practice. Sondra has been described as the “Mother of Rebirthing”, because of her extensive training of rebirthers and her expert knowledge of how our birth trauma affects our lives. Rebirthing is also known as “breathwork” and “conscious connected breathing” (however “breathwork” is also used for other breathing styles). Rebirthing is a breathing process that increases our ability to feel and resolve the effects of our past. The result is an increase in the level of physical and spiritual energy in our body, thus cleansing the many tensions held there. The result of the physical cleansing is that the mental and emotional origins of tension come back into consciousness and can then be healed. By learning to breathe consciously and fully, we discover and release the core issues now held in our mind and emotions. Using a deep connected breath for approximately one hour, the Rebirthing process releases stress and tension from the body and accesses and releases stored emotion. The rebirthing breath opens the body’s energy channels and accelerates the flow of creativity and intuition. Sondra invented the Loving Relationships Training (LRT), which is a weekend healing seminar/workshop, lead by various different trainers. I attended my first LRT in 1986, and I remember the deep sense of connection I had with everyone and everything around me afterwards—which has never left me. After that I participated in LRT events for about 3 years, one of which was lead by Sondra herself. These workshops used very creative processes to bring about healing. Sondra still holds LRTs and other events today, all around the world. The latest excitement is that Sondra has recently got married! Her husband Mark Sullivan is a rebirther, teacher, artist and poet, and he travels with her, organises for her and participates in her seminars. They got married in India, and will be living in Tennessee. • Pure Joy – Sondra wrote this at Sorrento, just out of Melbourne, which is quite close to where Frank lived for many years before we moved in together. The last chapter is sub-titled ‘Finding the Australia within you’. • Rebirthing in the New Age (with Leonard Orr) – about the early, pioneering days of rebirthing, and though the rebirthing information is somewhat out of date, it’s a funny read for anyone who has lived in a share house. I remember first hearing Sondra speak. … In her words and, even more powerfully, in her being, I knew that night I had found a guiding light. … If Sondra writes a new book, I read it. I let go of my left brain and drink her in. I heard Sondra say in an interview that while the artist was designing the cover, there was an earthquake! As far as I know there are nearly 7 billion people in the world today, and I think there would be about that many ways of both healing ourselves and achieving immortality of the body. We need to find our own individual approaches to these, in my opinion, the same as we do with anything. My approach to healing and physical immortality is a little bit different to Sondra’s… on a superficial level, anyway. As far as I’m concerned, though, her leadership, knowledge, service, love, creativity, humour and plain gutsiness in these areas are fantastic, and for these I am very grateful. Thank you Sondra! * * *I’d love to hear what you think about any of this, if you would like to leave a comment below. If you don’t have a blog or a website, leave the ‘website’ box blank. The more I read your posts on rebirthing and breathwork, the more curious I become. Sondra sounds like a remarkable woman who not only writes and speaks on the subject, but successfully practices the techniques, as well. Knowing she’s been such an influence in your life, reinforces your recommendations of her books. How fortunate you are to have attended a class conducted by her. That must have been a remarkable experience. When time permits, I’ll come back and watch the video. Your statement about how birth trauma affects us has me intrigued. Hi Robin. I attended a workshop once and did some rebirthing work around my relationship with my mother. It was very intense and I was able to feel much closer to her after. Also, I used to study with a native elder who taught apprentices “breath therapy”, and over a period of months received numerous treatments. It is fascinating how working with the breath opens up new insights. Your experience has obviously had an incredible effect on you, to have stayed with you so long. I love feeling how much you value this and seeing how much energy you are willing to devote to sharing this. It is inspiring. I’m going to come back an listen again. What she is talking about isn’t totally new to me but I still enjoy finding new people that are like minded. I’m a bit under the weather with a head cold to chat right now. I’ll be back at another time. Hi Robin – I’m very intrigued by this subject. And now that Davina has mentioned relationship-healing qualities, even more so. You have obviously done an enormous amount of study and practice, and you’re so enthusiastic about it, you make me want to learn more. Where would you suggest I begin? Betsy Wuebkers last blog post..MOM, PATRICIA TAGGED ME! @Barbara – thanks for all that Barbara – Sondra is indeed a remarkable woman. I hope you find some of this information useful! @Davina – my relationships changed after starting this work, too. That sounds interesting about the insights you got from working with the native elder. @Ribbon – have you done some of this work yourself, before? I’m in suspense, now! I hope your cold clears up soon! (I thought you weren’t allowed to get colds in Perth). @Betsy – I’m glad you find it intriguing. You could start by reading about rebirthing on Sondra’s website and looking through the Philadelphia Rebirthing Center website. It might be best to contact a rebirther – I’m sure I don’t need to tell you this, but it needs to be someone who you feel you relate to. I am happy to help you out further by email. I think it’s interesting how deep breathing is recommended in so many wonderful modalities. Amazing to think about all that stink of anesthesia coming out. Makes me want to ask my Mom what she may have taken to aid in my birth. Pretty powerful stuff indeed. I am life! Well, her hair looks astounding, she definitely was on the right track with its rebirthing. I will have to look for her if she comes to Austin as I have a perfect brand-new in package 100% silk scarf that exactly matches / complements the colors e’s wearing in the top photo of her. (Someone gave it to me and they are not the colors I wear.) Or maybe I could mail it to her. Your bookshelf must have a glowing aura all its own, Ronin. So many wonderful yummy books of joy and love! Now both our computers are without sounds, so I’ll have to come back here when the desktop gets fixed to see her on the clip, as everything you describe about her sounds warm, inviting and so inspirational. sorry, “she’s” wearing it should read. Oh, and I called you Ronin. Sorry, Robin! Go back to bed Jannie. What a remarkable woman, and a fascinating topic. I’ve read about rebirthing a long time ago. It’s interesting to read and to learn more about it. I have 3 of Sondra’s books. Haven’t done rebirthing but need help on deep breathing! I have been into ACIM for 25 plus years with my husband. I can’t tell you the effect it has had on our relationship we have been married for 37 years and known each other for two before that. Amazing eh? Thanks for bringing up the great memories from the beginning of my spiritual path. You rock! Very interesting. Thanks for turning us on to Sondra. I will delve into some of her writings and let you know what I think. Thanks so much for posting this. I couldn’t watch the video right now, as my connection bandwidth dropped too low, but I will try again later (mornings are sometimes slow.) But I am familiar with some of Sondra’s work, and others on rebirthing. What is so fascinating to me after years of studying Buddhism is that to me it sounds a lot like some Tantric Buddhist teachings on releasing karmas in one lifetime through kundalini and chakra work that would ordinarily take many lifetimes to do. That’s how I think of rebirthing – a releasing of energy momentums or karmas that have been trapped. And that is what kundalini rising and chakra work is meant to do also. Hi Robin: It’s so true: everything I’ve read about psychology–before coming across positive psychology–centers on analyzing the darkness. I don’t see how that can possibly be helpful. It’s so much more effective to look for ways to bring more light into your life. Like Sondra says, the light pushes away the darkness. This is very interesting. I still don’t quite understand why it’s called rebirthing, but at least now I know it’s not really about being reborn physically. There used to be a practice back in the 1970’s of imagining your birth, reversing it and doing it over. At least, I think there was. I’d like to watch the video on the weekend when I have time (can’t watch videos at work :-)). For myself, there are a variety of things I use to bring up old feelings to be resolved by psychotherapy. This isn’t a technique I’ve ever used, but I may try it some day to see what it does for me. Her new book sounds really intriguing! Very interesting topic. I have never heard of this before. I do enjoy Sondra’s spirit, she is very likeable and very zenny. Giovanna Garcias last blog post..Stop chasing for Perfection. I will have to come back and watch the video as my computer is not working right tonight and I really need to visit dreamland soon. I remember a great deal about re birthing groups when I was in graduate school, but I could not go to the lectures and gatherings because it was far too much money. 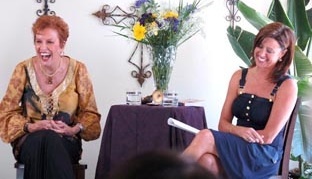 I cleaned house for a woman who was a re birthing instructor and Marianne Williamson came to her house one evening for a seminar introduction – maybe that counts too! I like Marelisa’s comment about bring lightness not the darkness into our relationships. 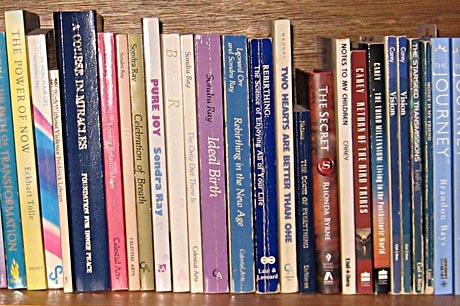 I do so enjoy Louise Hay’s information – I have lots of her material on my bookshelf, but not as full as yours! Patricias last blog post..And The Winner Is! @Vered – living where you do Vered you are absolutely surrounded by all things rebirthing, should you become interested in it. @Tess – thanks Tess! Yes, LOL. That’s so interesting that you are into A Course in Miracles – I haven’t actually ever done the Course itself, but I have read the other sections/books many times – and I figure all the workshops, reading, etc I have done are all based on the Course, so I was getting it that way. @Mark – hi there Mark – I’m glad you find this interesting! @Lisa – yes – I think “releasing trapped karmas” is a good way of putting it – because the birth trauma occurred in the first place because it was the scenario we wanted to create in this incarnation, so we could resolve those issues. It’s time to let them go! @Marelisa – hi there Marelisa – I’m glad you tuned in on that in the interview, because I think it would be fair to say this is a central difference between rebirthing and many other approaches to healing – you just breathe the rubbish out (or breathe through it) rather then getting caught up in analysing it. Do we pick through the garbage bin before putting the bin out? @Dot – I think there were a lot of practices invented in the 70s! This method is a physical one, rather than consciously imagining anything. The “rebirthing” name was invented initially because the process released birth trauma. @Mama Zen – hi there MZ – you can read the first few pages on Amazon. @Giovanna – hi there Giovanna – I’m glad you find Sondra and her work interesting – I think that at the least she provides some things worth thinking about. @Patricia – I hope you enjoy it Patricia! That sounds interesting about working for a rebirther – I wonder if she is still doing it. I enjoyed Marelisa’s comment very much, too. The name Sandra Ray is familiar but I have never got to knowing who she is and what she does. Your introduction about her is certainly an interesting one for me. From what your book shelf is having, I can see that you are quite a fan of her work! Thanks for the lead! I may just check more about her techniques one day! Thanks for this post. I definitely resonated with what you said about conscious breathing revealing the tight places in our bodies — I suspect that’s one reason we tend to avoid thinking about our breathing, because putting our attention on it forces us to feel the tension we carry around. My practice recently has been to really immerse myself in the tension and do whatever it seems to want my body to do, and this has been deeply healing. okay just why was her hair falling out? i seriously think there is something weird going on with my hair…like more and more in the comb than on my head. @Evelyn – I’m glad you find this interesting – I think it would be fair to say Sondra’s outlook fits very nicely with your own ideas. @Chris – I really like the way you talk about immersing yourself in the tension – I too think this would be very healing. @Natural – perhaps you could write to Sondra and ask her! Rebirthing leads to transformation of the body, while many people use meditation to transcend the body, so I would describe the two processes as complementary rather than forms of the same thing. If YOU like those colors I could send YOU the scarf, altho I see you more in moss greens and fawn colored cotton of the softest variety. Jannie Funsters last blog post..Another chance! The key to self improvement is channeling continuous positive energy while focusing on areas that of weakness. And it always helps to have an idea of what it is you want to be when you grow up. Breathing certainly has many benefits. I find it very calming – some deep breathing – when I’m anxious. So, learning about Sondra (I hadn’t heard of her before this) was wonderful! Thanks so much for sharing. @tarekalghnam – thank you – the softest of greetings to you, too. @Jannie – I’d LOVE a bright orange-red silk scarf – it would probably be too intense for me to wear in daytime – but at night it would be GREAT! Any yellow-based colour suits me (but it needs to be softish for daytime). @Mike – hi there Mike – working out what we want to be when we grow up seems to be an ongoing occupation! @Lance – I’m glad you find breathing beneficial, Lance! (just teasing) That’s interesting that you use deep breathing when you are feeling anxious. Ha! So, breathing – it’s something I’ve decided to do every day. It’s so…life giving!! My partner Michelle and I travelled with Sondra to India for the past two years. This year, we ended up representing her parents at the wedding ceremony!! How amazing is that! Anyway, a bit of a plug for those in Western Australia (and Adelaide and Sydney)… Sondra is coming over in November 09 with her husband Mark to do some workshops and speak on various topics. For more info, go to http://www.mybreathwork.com or contact me on richsound1 AT gmail DOT com. Hi Richsound – GREAT to hear from you! The wedding must have been lovely, and no doubt it was wonderful being part of it. Thanks for the info on Sondra’s tour – and thanks for the appreciation! Hello to everyone! I am trying to find some comments or experiences of people who have actually worked with Sondra’s book ‘The only diet’. Does it really work?? Has anyone lost weight with this book??? Hi Louise – I read this book a long time ago, and I don’t remember whether I experienced weight loss – however, at the time I was doing lots of things, so it’s hard to tell what works, anyway. I do think it is a good book about forgiveness. Thanks for visiting!